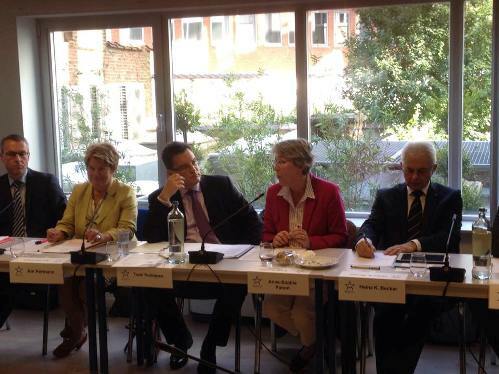 On October 1, on the occasion of the UN International Day of Older Persons, the European Seniors’ Union (ESU) organised a Food for Thought event together with the Wilfried Martens Centre for European Studies about: “Europe’s Senior Voters: Long Term Implications and Challenges for the Centre Right”. Based on a research entitled Seniors in the 2014 European Parliament Elections: Turnout, Voting Intentions and Representation, by Lawrence Cappelle, Gilles Pittoors and Steven Van Hecke, an analysis of how seniors voted in the 2014 European Parliament elections was presented by prof. Steven Van Hecke. There was also panel discussion with Anne-Sophie Parent (AGE), MEP Heinz K. Becker and Gavrilo Nikolic (2015 Wilfried Martens Fund laurate KU Leuven), which was moderated by Tomi Huhtanen, Director of the Martens Centre. After a Q&A moment, ESU President An Hermans gave her conclusions. Please find the full speech of An Hermans in attachment below.